Enhance your students’ knowledge about radiology through Aquifer’s interactive Radiology Flipped Classroom Modules. These modules were developed by a group of nationally recognized radiology educators and shown to influence student learning. Flipped Classrooms are meant to be interactive learning sessions with the students (in a non-threatening setting for student participation) to reinforce materials covered in the case. Students like the Flipped Classrooms as an alternative to didactic lectures. It also gives them the opportunity to ask facilitators about any problems they had with the case. There are 18 Flipped Classrooms corresponding to 18 Aquifer Radiology modules and Educator materials available on how to use Flipped Classrooms, what the concept of Flipped Classrooms entails, and how to implement them (video demonstrations, references, etc.). This is a great resource if you have never used the Flipped Classroom or are unfamiliar with the concept. All Flipped Classroom cases have excellent radiographic examples, pertinent annotations, and are appropriated to the materials covered in the case. All modules are in PowerPoint format, with material embedded in the Notes of PowerPoint. This information is provided to the facilitator for each PowerPoint slide (what questions to ask students, the answers to the questions, what learning points to emphasize, etc.). This is not visible to the student when projected on the screen in PowerPoint. This allows any facilitator (from resident, fellow, to staff radiologist) to facilitate a great interactive session. Providing questions (and answers) to the facilitators should make them comfortable doing these sessions. Of course, the facilitator can ask own questions, etc. The notes are meant to provide a guide to the facilitator. Educators can choose to add some of their own cases, delete examples, etc. It is essential that the student complete the Case prior to the Flipped Classroom. The Flipped Classroom reviews the pertinent learning materials using radiographic case examples. It is meant to be an interactive learning session with student participation. They are designed to last 60-90 minutes. Documentation of teaching is important in many medical schools for faculty evaluation and promotions. Faculty who use these prepared Flipped Classrooms can document teaching time with medical students. Some medical schools will require a student evaluation of the presenter and this can be done by each institution’s policy. 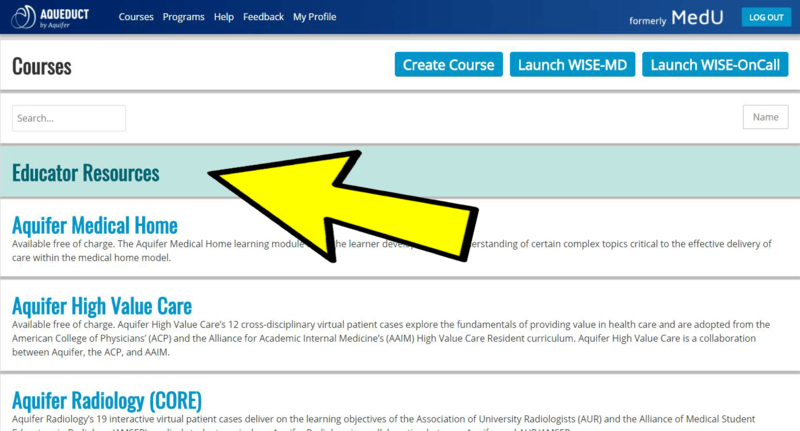 Aquifer Radiology Cases and Flipped Classroom Workshop resources can be used to “Flip” your classroom, and make precious instructional time more productive and valued. The Active Learning Modules are available to educators who are registered in Aqueduct through an institutional subscription. To access educator resources for your subscribed courses, sign in to Aqueduct and navigate to your Courses page. You’ll see the educator resources at the top of your screen. All Active Learning Modules are available for download to course subscriber educators and administrators.